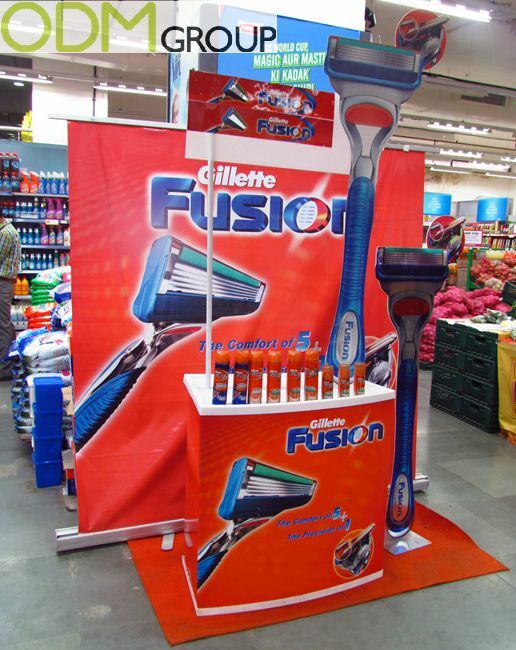 Gillette, with its famous innovative profit model of disposable razors depends on a great In Store Display. They grab attention and pull in customers in store, increasing sales and profit. Here we have a great example of a successful eye-catching display. Doing a great job of marketing the products offered by Gillette while simultaneously pushing the “fusion” branch of products. With particular focus on the number of blades, the in store display clearly represents the core competencies of Gillette. Comfortable great shaving. A good in store display should do just this, provide information to the consumer about whatever you are selling and why it is worth buying. This in store display is a prime example, but what other benefits can a great display bring to your business? What benefits does a great in store display bring? Brand Recognition – With a memorable display such as Gillette’s, consumers will immediately recognize your brand, and why it is better than the competition. This increases the chances of a sale to passing customers In Store, but also implants the memory of your brand for out of the store. Pull Marketing – With an in store display used like this at the end of an isle, consumers are more likely to purchase your product as it becomes more accessible for impulse purchase. Razors are a great product for this style as it reminds a consumer that he may need more disposable razor ends. An easily forgettable product for the weekly shop. Positive Brand image – A creative, memorable display such as this creates a great image for your brand. A strong brand image in turn increases sales as consumers view you in a better light than those of your competitors. Giving market advantage. Also for great information to operationalize your business’ marketing efforts, visit the ODM blog to find out more!